Imagine your family of 9 riding dirt bikes, four wheelers, or even a jet ski at your favorite destination. 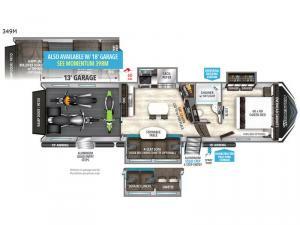 This Momentum M-Class 349M fifth wheel toy hauler offers a 13' garage for your toys and a side man door for easy access when the ramp door is closed. You can store additional outdoor gear in the exterior unobstructed pass-through storage near the main entrance. Now imagine your family watching the big game on the 49" LED TV with a fireplace below while sitting on the bar stools at the kitchen island or on the four-seat sofa. Now stop imagining and start living the dream in this M-Class! With any Momentum M-Class toy hauler fifth wheel you will enjoy extraordinary living with extreme playtime with the Weather-Tek insulation for four seasons of protection, and a fully enclosed fuel pump station to keep the fun going the whole time. The Tuff-Ply garage flooring is gas and oil resistant, plus triple insulated. You will find 2,500 lb. rated flush-mount tie-downs to keep your toys secure while moving down the road. The interior includes a sofa with headrest and removable swivel table, a convection microwave, a central vacuum system with tools and a dust pan, and a satellite/solar roof access channel to mention a few highlights. Any Grand Design Momentum M-Class allows you to keep your active lifestyle no matter where you decide to stay!